San Bruno Police Chief Ed Barberini said three gunshot victims, and a fourth person hurt running from the attack, were transported Tuesday afternoon to local hospitals. The woman found at the scene appeared to be dead of “a self-inflicted” gunshot wound, he said. While no motive was given for the shooting, two law enforcement sources told the Associated Press that the incident was being investigated as a domestic dispute. Media including NBC’s local affiliate and Kron4, citing anonymous sources, identified the shooter as southern California resident Nasim Aghdam. Violence on this scale is rare on the modern, sprawling grounds of Silicon Valley’s technology companies, and it may result in a re-evaluation of the security at the open campus atmospheres they tend to favor. Rates of workplace violence have declined since 1994, according to the U. S. Justice Department. Just 4 percent of homicides at work in 2010 occurred in the professional and business-services sector, according to the Bureau of Labor Statistics. The shooting shattered what had been a quiet, sunny day with many people outside for lunch. Workers at the headquarters of the video-sharing website said they heard gunshots and what sounded like banging and people running outside. Immediately, the Twitter feeds of employees began mentioning an active shooting on campus. Police said they first received emergency phone calls at 12:46 p.m. local time and the incident appeared to have started at a patio on the campus. 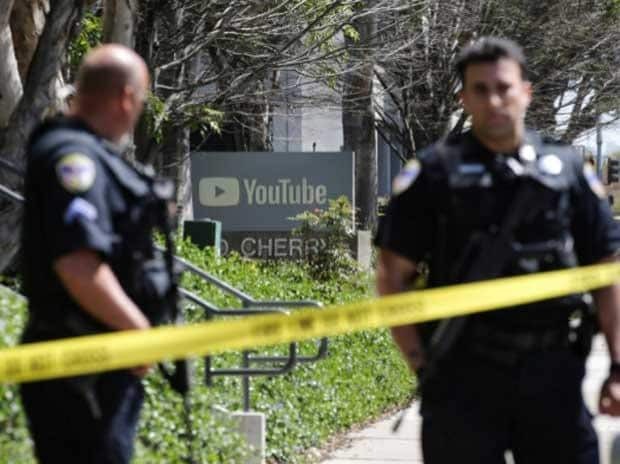 The person who allegedly shot at least three people at YouTube’s campus on Tuesday afternoon has been identified as Nasim Najafi Aghdam, according to senior law enforcement officials. The woman, who was 39 years old, is believed to have carried out the attack because of a domestic dispute, officials said. The authorities said terrorism did not appear to be a motive at this time. The shooter used a 9 mm handgun. Aghdam, who authorities say last lived in the San Diego area, had previously claimed in a video that YouTube “discriminated and filtered” her content, according to NBC Bay Area. 2. YouTube shooter criticized company’s Video Policy: The woman who police say went on a shooting rampage at YouTube headquarters on Tuesday was a video creator who criticized the company for policies she claimed limited her audience, according to media reports. Police in San Bruno, California, identified the suspect as Nasim Aghdam, according to news organizations including The Los Angeles Times, which cited an unidentified law enforcement source. 3. Google issues statement on the shooting: Google, the parent company of YouTube, issued a statement, saying that “We continue to actively coordinate with local authorities and hospitals. Our security team has been working closely with authorities to evacuate the buildings and ensure the safety of employees in the area”. 4. 4 injured in the YouTube shooting: “We have a 32-year-old female who is in a serious condition, a 27-year-old female in a fair condition, and a 36-year-old male in a critical condition,” KPIX 5 TV quoted Brent Andrew, spokesman for Zuckerberg San Francisco General Hospital, as saying. The shooting took place in an outdoor cafe at the YouTube campus in San Bruno in the US, which houses at least 1,700 employees. 5. US President’s thoughts with those aggrieved: US President Donald Trump said, “our thoughts are with everybody involved”. In a tweet, Trump said he had been briefed on the shooting at the YouTube headquarters. “Was just briefed on the shooting at YouTube’s HQ in San Bruno, California. Our thoughts and prayers are with everybody involved,” he tweeted.